Jazzperiments Jam is an interactive music application. The main objective of this project is to generate an interesting musical response on audio input and to offer an inspiring environment for improvisation and intuitive musical experiments. The application picks up sound, determines the pitch using Fast Fourier Transform, measures the tempo in an intelligent way, processes only the notes of the selected scale, transposes notes with selected intervals, delays notes with selected rests, plays notes with selected midi instruments or 'real time' live recorded samples. During a session the only input device is a microphone and often it feels like playing with your computer without any interface. With a 'normal' voice microphone you get the best results (much better than with a built in laptop mic). When you change the Arrangements (control 53), you can easily explore different sounds. It is also interesting to experiment with (transposed or delayed) feedback. In this live clarinet solo the sound of a tuning fork is sampled and used as automatic accompaniment for a fully improvised melody. Due to the 3 second pause after the first 'chorus', the system is set to record new samples and during the rest of the piece live clarinet samples are played as according voices. During the session nobody touched the computer; the recording wasn't edited. The rich heritage of music notation was the theme for the Erfgoeddag 2018 (heritage day) in the Matrix New Music venue. 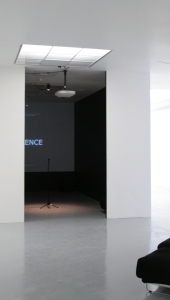 The interactive Aria - According to Cage - installation was part of the exhibition of diverse music notation experiments. 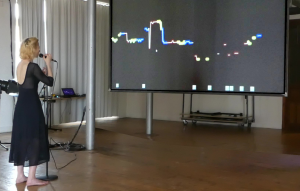 Soprano Maja Jantar and trumpet player Bart Bernaerts used the app for demos and experiments. 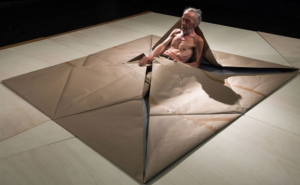 Fourfold is a performance/play by Meryem Bayram and Guy Rombouts representing the words 'no now here where nowhere' in the AZART alphabet created by Guy Rombouts. 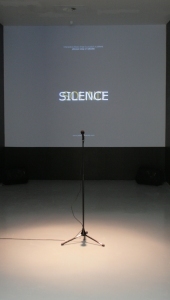 During the performances the words are spelled in space, while the stage changes from a square in a triangle. The soundtrack uses the AZART music alphabet which was developed by Jazzperiments as part of the AZART web application www.azart.be. The premier of the performance took place on 19 November 2017 in STUK in Leuven. IN C of Terry Riley is performed on the Meakusma Festival 2016 in Eupen by the Christian Klinkenberg Orchestra and Champ d' Action. In seperate workshops the IN C app is demonstrated and Christian Klinkenberg creates his CCC composition for live performers and the Jam App. Hearing voices is a composition which combines a deliberate use of the pattern matching algorithm and free improvisation for a solo singer or a player of a monophonic instrument. The result is a polyphonic piece. While working on this project the Jazzperiments app was rewritten as a stand-alone Java application which is a lot faster than the app and doesn't trigger the security warnings of Google Chrome. In C by Terry Riley is an iconic minimal music piece which is 50 years old in 2014. With the IN C App everybody everywhere will be able play this piece together. 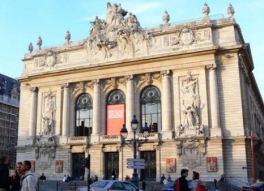 This complex project is realized in cooperation with Champ d' Action. During Iedereen klassiek in the Concertgebouw in Bruges the app was used for the first time live with 10 musicians, 10 members of the public using tablets and 4 international players from Japan, Germany, Benin and Brazil. Since this premiere In-C-sessions are performed every hour of every day with any number of players (including 3 'bots'). A special edition of Muage, according to Cage was written for the Words Live IV festival in Perdu in Amsterdam and Wall Gallery in Rotterdam. The piece was read simultanionsly by Cora Schmeiser, Teun de Lange, Mariëtte Groot, Ben Zwaal and Samuel Vriezen. In order to improve the performance of Jazzperiments Jam in intuitive improvisation the use of pattern matching in a musical/harmonic context was studied and proposed for an exchange of ideas and further development of the application. Video of talk about Jazzperiments - concept, demo with clarinet and new ideas - at FOSDEM 2013, Université Libre de Bruxelles, Sale Ferrer, 16:40-17:00. During a three day festival in De Singel in Antwerp, the installation is available for use by the audience of the festival and students of the conservatory. On John Cage's 100th birthday the booklet MUAGE, according to Cage is published and presented at Revolution 100.000.000etc Gallery in Middelburg, Holland. The publication, concert and installation explore different aspects of Cage work based on 10 citations. During the international FOSDEM conference on open source software in Brussels and as part of the lecture of Karl Helgason (the Icelandic inventor of Gervill), Jazzperiments was demonstrated as a use case of this great Java sound engine. 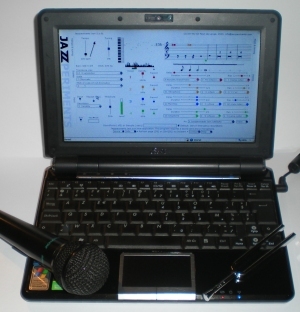 An automatic bass line with midi instruments and interactive live sampling were triggered with clarinet input. In 1958 John Cage invented a free (liberating) and intuitive notation for Aria. This piece is the inspiration for an installation in the Opera of Lille (France) during the Big Bang festival organized by Zonzo Compagnie. The voice of user/singer is projected on a screen in this intriguing notation. And samples of his or her voice are accentuated in colours, recorded and played back according to the input ... but transposed as the bass voice of mister Red, the alto of Lady Yellow and the high soprano notes of Miss Blue. Non-tonal 'percussion' sounds are shown as little blocks like in the notation of Cage. Some young and old singers (forming their very own sample 'choir') discovered that you can do amazing things your voice! Triggered by remarks of the experts of STEIM, Amsterdam, Jazzperiments Jam is made tempo sensitive. The tempo measurement is based on dynamic and melodic variations (in this context Fourier analysis is very important too). However putting this measurement to use was quite challenging. Experiments with a variable beat were no success at all (though quite funny: a bit like playing with a very drunken drummer). In the present configuration the tempo measurement can be applied to the number of notes played in a bar, either following the tempo of the input (Auto Sync = default now) or opposing it (Auto Async). The tempo always changes to equal parts of the bar at the chosen bmp and the note length and the tempo are displayed. This addition to the system allows a musician to change the tempo by playing examples of a desired rhythm and makes the resulting music much more ly. Performance in the library/art centre of Dendermonde (B) during an exhibition of Guy Rombouts, exploring Coltrane and interactive improvisation. The application (started with the big link JAM in de left menu) works from today in default mode with real time recorded samples (with your own input instead of midi-sounds). Reason: it is easy now! There are new recording modes which differentiate between recognized frequencies (notes) and levels (noise). In automatic mode samples are only recorded when there aren't any samples played at the same time. If a voice is ready to record a sample, the icon is shown, when it isn't it has the icon . For course you can still change the settings to use midi samples. This week 'Urlauten' from the famous Ursonaten of Kurt Schwitters (who died on the 8th of January 1948) are used as transposed samples in the installation at Verbeke Foundation. Rakete bee bee ... Fümms bö wö tää zää Uu pögiff ... all according to nature. 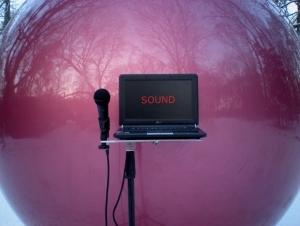 According to nature is a new sound installation at Verbeke Foundation in Kemzeke (B). Nature is full of sounds with harmonics which also occur in music of African tribes, Balinese gamelan or ... fugues of Bach. Birds and many other animals 'sing' for about the same reasons as human beings. And still we generally don't regard sounds from nature as music. In this installation sounds from nature cause transpositions of the 'standardized' sound of a tuning fork (A 440 Hz) to a tuning that matches the input. Notes which are 'recognized' in this way, are played back in corresponding chords and in a spectrum of 3 different voices (red, yellow and blue). 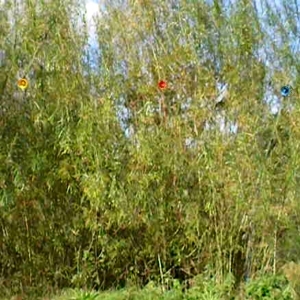 Of course, the input is variable and unpredictable: the sound of the wind in willow trees, of birds, of traffic at a distance, of visitors ... but apparently there is music in almost every sound ... maybe music is more natural than we think. The microphones used in this project are very sensitive and pick up sounds from a wide range, however the software only processes soft sounds with some kind of 'tonal' quality, filtering out 'white' noise, crackling sounds, shouting etc. 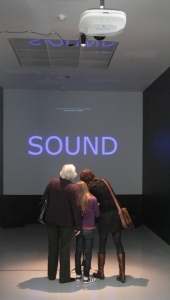 During the Time Canvas 2010 exhibition organized by Champ d' Action an Interactive Music Area was installed in the M HKA Museum in Antwerp for everybody to use. Some nice music! An 'interactive music area' is a place where sound induces sound in pentatonic relations and in specific rhythms. The system indicates the difference between silence and sound and shows the pitch in colours. It is up to the visitor/user to experience his own input as music ... or not. 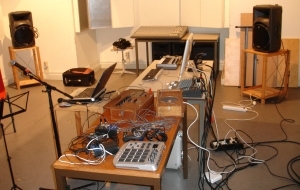 The Jazzperiments Jam application is the engine of this installation, which can by setup practically anywhere; for instance near Yayoi of Corey McCorkle in a snow covered Middelheim Museum in Antwerp on 7 January 2010 with the sound/music of wind and a few birds. The pitch of the selected scale can be set automatically to the first note recognized after a pause in which all delayed notes are played. A sample of this 'first' note can be recorded automatically as well. The Jam applet is certified and the website with this project is online via www.jazzperiments.com. The old website still can be opened via www.jazzperiments.com/site2004. Experiments tend to explore unknown territory but they invariably originate from tradition and known facts. Modern, fast computers and innovative software have paved the way for a responsive interactive music application: Jazzperiments Jam. Using this new application in performances involved not only 'corresponding' new ideas, but also references to existing theory, tradition and experience. 'Regular' instruments - clarinet, piano and guitar - have proven to be most effective to trigger accurate responses. Ensembles with 'classic' synthesizers - the famous Moog - produced the best sound. Classical music theory of scales, chords and intervals provided a stable basis for comparison and connectivity with other systems and concepts. • from a thousand years old theoretical perspective - Arezzo Too. Guido d'Arezzo (991-1033) is the founder of 'modern' music theory. He developed staff notation and solfeggio, the progenitor of the do-re-mi scale. The syllables of this scale are taken from the first six musical phrases of the hymn for Sancta Ioannes, Ut queant laxis. This edition explores how this ancient source of musical expertise can initiate new music. A tuning fork represents a universal music standard and allows musicians to play together. By modifying/tuning a tuning fork it loses its universal value and at the same time becomes a unique primitive/basic instrument. Although this instrument may produce only a single note, the sound can be a starting point for new music. 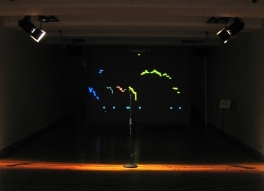 The project of Really Ready (Miguel Horacio Sosa, Guy Rombouts, Teun de Lange) was presented on 13 September 2009 in Annie Gentils Gallery, Antwerp with a small concert. The project involves two limited editions of 182 copies (2 editions of 26 series of 7 versions). The recording on each (!) memory stick or CDR is a unique representation of the concept. The session has not been recorded on any other medium. Like an etching or engraving, every copy of the editions has its own character. 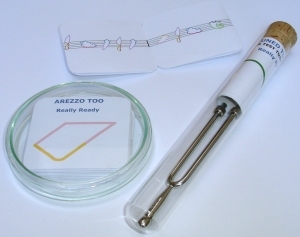 The packaging in a test tube and a Petri dish (usually used for culturing cells or bacteria) underlines the editions' experimental nature. The frequency of notes produced by instruments or the human voice is not constant during the attack of the note (wind instruments and voice: lower, piano and percussion: higher). The minimum sample to get an accurate measurement has to be about 100 ms long. Experiments with shorter samples and some kind of control mechanism were not accurate enough or even slower. There is no way to avoid the latency caused by this feature of musical instruments. To reduce the net latency the program reads the sample of 100 ms in 4 chunks of about 25 ms and calculates the frequencies each time for the 'shifting' sample. The acquisition of the sample, the calculation for Fast Fourier Transformation and all other processing by the program take about 35 ms. The calculation could be optimized somewhat, but the experience is that this doesn't reduce the processing time by more than a few ms. The input and output latency of the hardware and the OS (infamous under Windows) both affect this system. As this is a free online program there aren't many options to reduce this latency from within the application. The user can select a delay of 1/8 up to 12 bars and in this way cause a kind of voluntary latency. Short delays create arpeggios; long delays can result in something like automatic accompaniment. After having tested Pure Data and Max MSP, I have dicided to rebuild the application in Java. The speed appears to be adequate and it is now possible to adapt the userinterface completely to the needs of musicians. The big advantage is that application can now be used online on many hardware platforms. 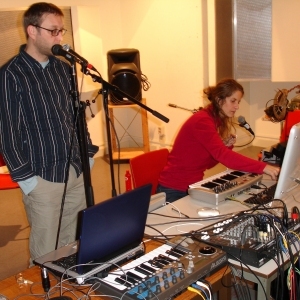 Really Ready is a ad hoc ensemble for experimental music first formed in 2007. 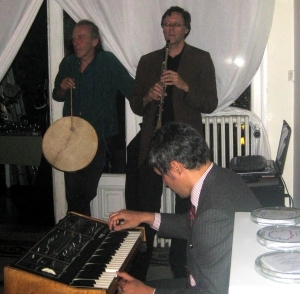 Members are Miguel Horacio Sosa (guitar, harmonica, Moog and other synthesizers), Guy Rombouts (visual design) and Teun de Lange (clarinet, software development). 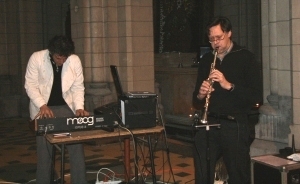 In April 2008 one of the first performances of Really Ready took place during a festival for experimental music in the church of Borgerhout, Antwerp. The concert was recorded for Radio Centraal 106.7. 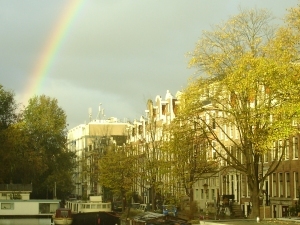 From the 16th to the 22nd of October 2007 I worked at STEIM (studio for electro-instrumental music) in Amsterdam on improvements of the system for performances. Detailed information of experienced performers of electronic music like Michel Waisvisz, Robert van Heumen, Daniel Schromo and Takuro Mizuta Lippit proved to be extremely useful. Experiments with the Lisa system of STEIM inspired me to include a module with which complex settings of the program can be changed with a single keystroke on a midi controller. With these options it will be possible to play longer pieces with varying structure. Testing the system in a professional studio with perfect acoustics, sensitive microphones and excellent speakers made it possible to improve the sound of the system (mainly the settings of the soft synths) dramatically. I even could do some tests with the famous 'Crackle synth' of Michel Waisvisz (2 wooden boxes in the middle on the photograph). The exchange of ideas and collaboration with my residency colleagues Sabine Vogel and Alex Nowitz were of great value too. They worked on projects for sensor controlled sampling in Lisa and Junction, but as a flute player Sabine and I experienced exactly the same problems using a wind instrument and a computer at the same time. All three of us worked with clear musical objectives in mind. At the end of the week we could make some interesting recordings with three musicians and two brand new musical applications.